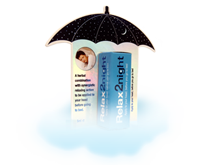 With over a 100 applications per stick, Relax2night is a herbal based formulation which can be applied to the forehead, and is used for its relaxing action. It is unique in its purpose and it is applied directly to the forehead and it is also a herbal based product for external application only. The compact design of Relax2night means it is easy to carry and apply when required up to 2 times daily. The clear wax consistency also ensures that there is no residue from using Relax2night and it evaporates. Relax2night is a herbal based product that contains traditional herbal ingredients, listed below. Menthol is an organic compound made from peppermint or other mint oils. It is a waxy, crystalline substance, clear in colour, which is solid at room temperature and melts slightly above. Oat Seed is a species of grain that is grown all around the world for its edible and nutritious seeds. In addition to being used as a source of food, the Oat Seed plant has beneficial effects on the central nervous system of humans. Various parts of the plant are used in traditional herbal medicine. Camphor is readily absorbed through the skin and produces a feeling of cooling similar to that of menthol. There are anti-itch gels and cooling gels with camphor as the active ingredient. The word camphor derives from the French word camphre, itself from Medieval Latin camfora and from Arabic Kafur. Camphor was known in Arabia in pre-Islamic times, as it is mentioned in the Quran 76:5 as flavouring for drinks. In the 9th century, the Arab chemist, Al-Kindi (known as Alkindus in Europe), provided the earliest recipe for the production of camphor in his Kitab Kimiya' Al-'Itr (Book of the Chemistry of Perfume). Chamomile is a common name for several daisy-like plants of the family Asteraceae. These plants are best known for their ability to be made into an infusion often served with either honey or lemon. Preliminary research suggests chamomile is an effective therapy. In Russia, chamomile tea is used for stomach troubles, colds, and muscle aches. Cloves are native to the Maluku islands in Indonesia and used as a spice in cuisines all over the world. Cloves are harvested primarily in Indonesia, India, Madagascar, Zanzibar, Pakistan and Sri Lanka. The essential oil is used in aromatherapy when stimulation and warming are needed. Essential oil of lavender has extracts are also used as fragrances for bath products. Lavender has many uses. Infusions of lavender are believed to soothe insect bites and burns. In pillows, lavender seeds and flowers aid relaxation. An infusion of flower heads added to a cup of boiling water soothes and relaxes at bedtime. Peppermint is a hybrid mint, a cross between watermint and spearmint. The plant, indigenous to Europe, is now widespread in cultivation throughout all regions of the world. It is found wild occasionally with its parent species. The oil also contains menthone and menthyl esters, particularly menthyl acetate. Peppermint produces a cooling sensation on the skin. It is also used as a calming agent. The extract of lemon balm was also found to have exceptionally high antioxidant activity. Lemon balm and preparations thereof also have been shown to improve mood and mental performance. Several studies show that lemon balm combined with other calming herbs (such as chamomile) helps promote relaxation.